TSPSC Telanagana Para Medical Posts Recruitment 2017:Telangana State Public Service Commission: Hyderabad issued Notification No. 61/2017,Dt. 08/11/2017 to direct recruitment of Refractionist In Insurance Medical Service. 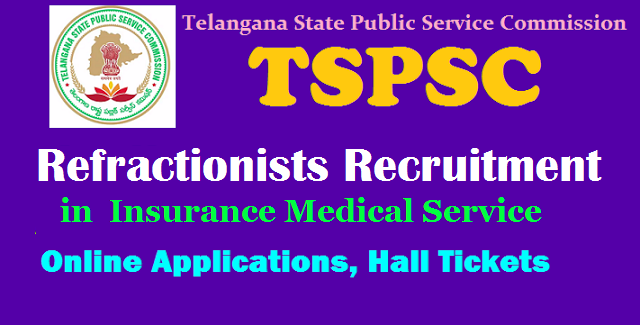 Applications are invited Online from qualified candidates through the proforma Application to be made available on Commission’s WEBSITE (www.tspsc.gov.in) to the post of Refractionist in Insurance Medical Service in the State of Telangana. The submission of online application is from 16-11-2017 and last date for submission of application is 11-12-2017 the details like TSPSC Refractionist In Insurance Medical Service Posts Online application form, how to apply, hall tickets, Answer Key, Selection list Results, Exam pattern, Selection procedure for TSPSC Paramedical staff, ANM, Lab Technician, Staff Nurses, Pharmacists and other posts 2017 and more details are given below. No.Of Vacancy : 01 Post. ii) Must possess a certificate of having undergone training as Refractionist and Optician in the School of Optometry at SDE Hospital and Institute of Opthalmology Hyderabad or any equivalent qualification from a recognized institution.